Eastern tent caterpillars (Malacosoma americanum) may be the only insects recognized by their homes rather than their appearance. These sociable caterpillars live together in silk nests, which they build in the crotches of cherry and apple trees. 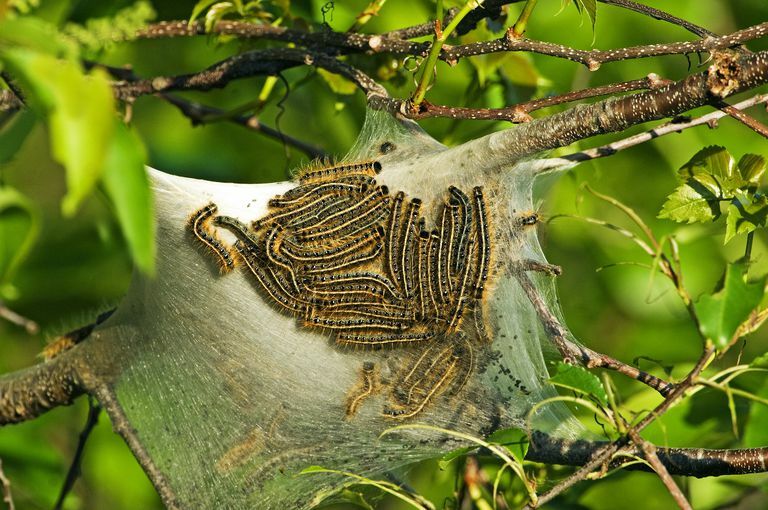 Eastern tent caterpillars may be confused with gypsy moths or even fall webworm. Eastern tent caterpillars feed on the leaves of some favorite ornamental landscape trees, making their presence a concern to most homeowners. In truth, they rarely do enough damage to kill a healthy plant, and if you want an interesting insect to observe, this is one to watch. Several hundred caterpillars reside communally in their silken tent, built in the crotch of tree branches. Models of cooperation, the eastern tent caterpillars live and work in harmony until they are ready to pupate. The caterpillars emerge in early spring. In their final instar, they reach over 2 inches long and sport visible hairs down the sides of their bodies. The dark larvae are marked with a white stripe down their backs. Broken lines of brown and yellow run along the sides, punctuated by oval spots of blue. Malacosoma americanum moths break free of their cocoons after three weeks. Like many moths, they lack bright colors and appear almost drab. A close look reveals two parallel lines of cream across wings of tan or reddish brown. Eastern tent caterpillars feed on the foliage of cherry, apple, plum, peach, and hawthorn trees. In years when Malacosoma americanum is abundant, the large number of caterpillars may defoliate their host trees entirely and then wander to less preferable plants to feed. The adult moths live just a few days and do not feed. Egg - The female oviposits 200–300 eggs in late spring. Larva - Caterpillars develop in just a few weeks, but remain quiescent in the egg mass until the following spring, when new leaves appear. Pupa - The sixth instar larva spins a silken cocoon in a sheltered location, and pupates within. The pupal case is brown. Adult - Moths fly in search of mates in May and June, and live just long enough to reproduce. Eastern tent caterpillars exit en masse three times each day: before dawn, around midday, and right after sunset. As they crawl along branches and twigs in search of leaves to eat, they leave behind silk trails and pheromones. The trails mark the path to food for their fellow tentmates. Pheromone signals alert other caterpillars to not only the presence of foliage but provide information about the quality of the food on a particular branch. Like most hairy caterpillars, eastern tent larvae are thought to deter birds and other predators with their irritating bristles. When they perceive a threat, the caterpillars rear up and thrash their bodies. The community members respond to these movements by doing the same, which makes for an amusing group display to observe. The tent itself also provides cover from predators and between feedings, the caterpillars retreat to its safety to rest. Where Do Eastern Tent Caterpillars Live? Eastern tent caterpillars may infest the home landscape, making tents in ornamental cherry, plum, and apple trees. Roadside stands of trees might provide suitable wild cherries and crabapples, where dozens of caterpillar tents decorate the forest edge. These early spring caterpillars require the warmth of the sun to heat their bodies, so tents would rarely, if ever, be found in shaded woodland areas. The eastern tent caterpillar lives throughout the eastern United States, to the Rocky Mountains and into southern Canada. Malacosoma americanum is a native insect of North America. Eastern tent caterpillar. Texas A&M University. Eastern tent caterpillar. University of Kentucky Agriculture Department. T. D. Fitzgerald. The Tent Caterpillars. Stephen A. Marshal. ​Insects: Their Natural History and Diversity. What Are the Special Adaptations of Evergreen Bagworm Moths? 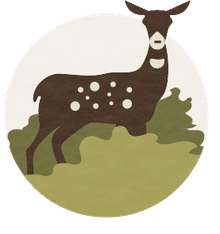 5 Insects You Do Not Want on Your Hardwood Trees.